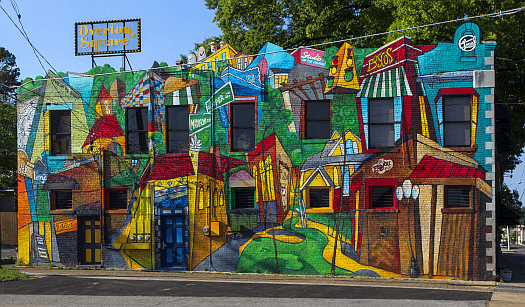 With its bright colors and whimsical style, Overton Square – Redux has become an iconic mural in Memphis’ Overton Square. Redux means to present something in a new way, and that is exactly what the mural does, placing a fun spin on a beloved Memphis locale. Artist, David Lynch was inspired by the unique location and its ability to attract people from all areas of Memphis when he painted the mural in 2013. The mural, intending to mimic the Overton Square experience, features several local establishments and landmarks, such as Playhouse on the Square, Boscos, and the Overton Square Chimes. Lynch added an additional four feet of masonry to the top of the building to create a one of a kind shape that resembles the Overton Square skyline. Complete with a vintage Overton Square sign, the mural perfectly portrays the area of town that all Memphians know and love. Located on the underpass of Willett St, the memories and participants behind last year’s 2017 Paint Memphis remain to impact our city in a unique and visual form; for these pieces scattered around the city can reflect a new message, or the creator’s intellect. Reaching out to a mother that was involved in Paint Memphis, Tiffany White, I learned the intriguing background of her creation and it’s process. Mrs. White explains how her mural is intended to illustrate a young girl with a hoop around her head, as she practices the popular activity of hula hooping. The girl in the respectable presence of a few flowers also sends a separate metaphor. “I desired for this hula girl to be portrayed as symbolic for the topic of the circle of life…these flowers sprouting around her really was to emphasize the natural state of it,” explains Mrs. White. 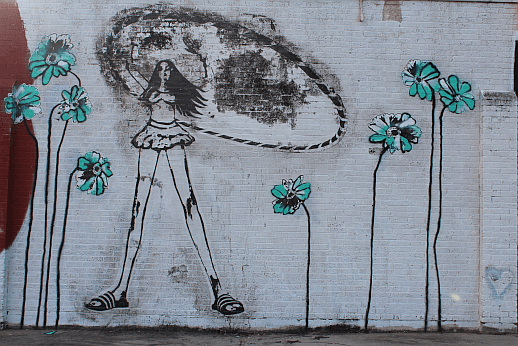 She has considered hula hooping to be a great hobby for about 5 years and believes that her desire behind the mural and its overall visual is to signify power and freedom to Memphis communities. In response to the tragic death of two Memphis sanitation workers in 1968, black men who worked in the sanitation business went on strike to protest the injustices that they faced in their line of work. It was Rev. James Lawson’s proclamation that inspired the slogan “I Am A Man”; “for at the heart of racism is the idea that a man is not a man, that a person is not a person. You are human beings. You are men. You deserve dignity” stated Lawson. In 2014 Marcellous Lovelace, who describes himself as the “Afro Urban Indigenous Folk Artist”, modernized the 1968 photography by Richard L. Copley. 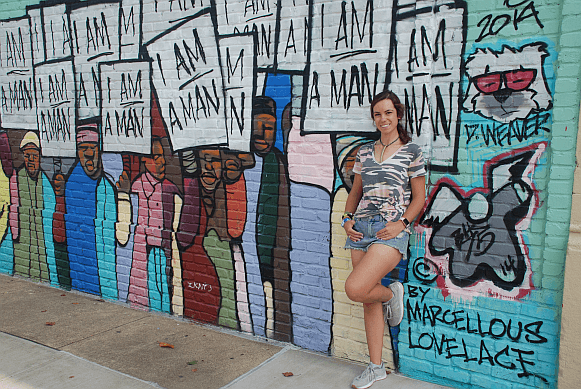 The “I Am A Man” mural designed by Lovelace embodies the fight and struggle for equality that took place in Memphis during the Civil Rights movement. 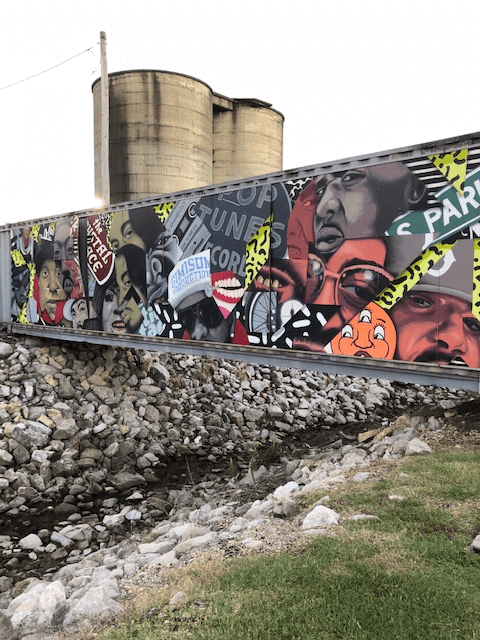 The mural was installed at South Main in Downtown Memphis by local artist BLK75 and has become an icon and a memorial to those who paved the way for equality. This eccentric, eye-catching mural by Brandon Gaia Marshall aka “nosey42” is definitely a convivial site for any devoted Mem-phian. The artist specializes in street art and graffiti paintings and has traveled across the country to reveal his undeniable talent. One of his most recent paintings of 2018, features the many legendary rappers of Memphis painted on the side of a shipping container located in front of WISEACRE. By capturing the soul, and cultural essence of Memphis, he aims to create a positive impact by instilling individuality and self-expression throughout the communityReduxOVERTON. 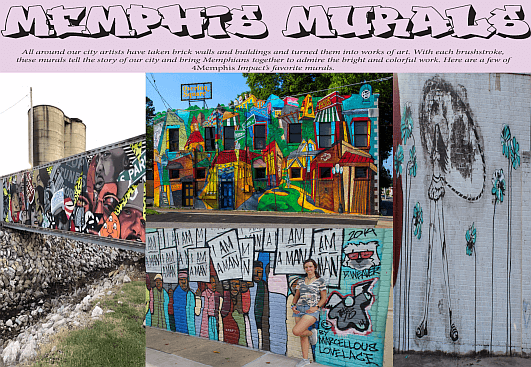 Share Memphis Murals from Memphis Impact & 4Memphis Magazine!